Head Phillips PH0. Shaft thickness 3.0mm. Blade length 60mm. Overall length..
Head slotted 1.5mm. Head thickness 0.23mm. Shaft thickness: 2.0mm. 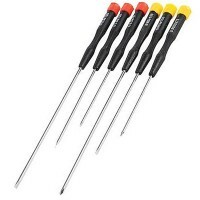 Blade le..
Silverline SD62 Extra Long Precision Screwdriver Set Features Extra long precision screwd..
Head Phillips PH00. Shaft thickness 3.0mm. Blade length 60mm. Overall lengt..
Head slotted 4.0mm. Head thickness 0.80mm. Shaft thickness 4.0mm. Blade len..
Head Phillips PH1. Shaft thickness 4.0mm. Blade length 80mm. Overall length..
Head slotted 3.0mm. Head thickness 0.50mm. Shaft thickness 3.0mm. Blade len..
Head slotted 2.5mm. Head thickness 0.40mm. Shaft thickness 2.5mm. Blade len..
Head Pozi PZ0. Shaft thickness 3.0mm. Blade length 60mm. 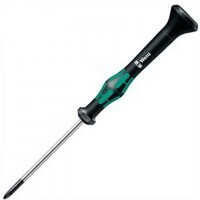 Overall length 157..
Head slotted 1.8mm. Head thickness 0.30mm. Shaft thickness: 2.0mm. 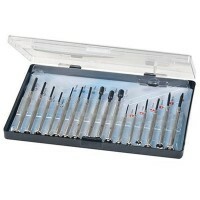 Blade le..
Silverline 633888 Jewellers Screwdriver Set Features 16 piece Ideal for accurate and deta..
Head slotted 2.0mm. Head thickness 0.40mm. Shaft thickness: 2.5mm. 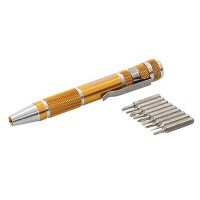 Blade le..
Silverline 633922 Precision Screwdriver Set Features 9 piece set. Suitable for smal..
Head Pozi PZ1. Shaft thickness 4.0mm. Blade length 80mm. Overall length 177..
Head slotted 1.2mm. Head thickness 0.25mm. Shaft thickness 2.0mm. Blade len..